DUG Insight User ManualFrequently Asked QuestionsFrequently Asked Questions Installation and SettingsWhy is exporting data from Insight light on CPU but heavy on RAM? Depending on the export, the issue could be I/O bound, waiting for the hard disk to spin. Unless there is anything highly computational in the export, you should expect to see low CPU usage. If you are exporting computationally-intensive data, use the performance slider in the Export Volume window to spread the load over multiple CPU threads. The export performance slider controls how many export tasks are created and shared between the CPU cores. Each task requires memory and in this case, it adds up to using everything that is available. Pauses occur during export if Insight fills its assigned memory and needs to clean up. If this is happening regularly, reduce the performance setting to a lower level. Lower values reduce the number of concurrent tasks and the memory requirements. For processor intensive tasks this will increase the export time. Increase the memory allocated to Insight in the DUG Launcher (see Allocating Memory). When running big export tasks, assign 80-90% of the total memory. This allows more tasks to run concurrently before a memory clean up is required, and may completely bypass the need for a clean-up. If the issue persists or you would like specific advice, do not hesitate to contact our support team at support@dugeo.com for assistance. 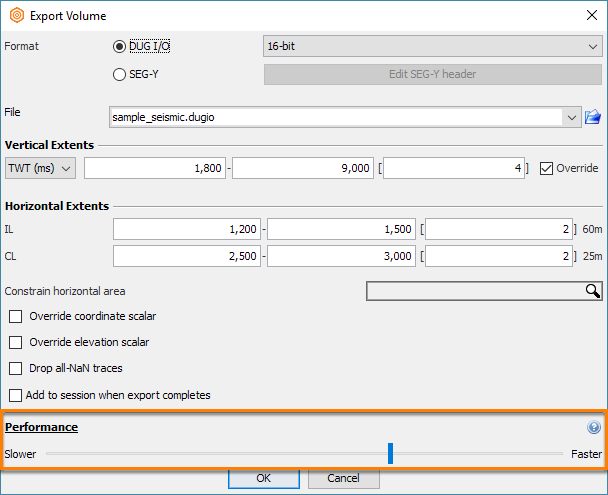 For more information, see Exporting a Volume to DUG I/O. Prev: How do I change Insight's default directory? Next: Why is Insight running unusually slow?